The destruction of the Ijaw communities in the Niger Delta is terrorizing people into fleeing their homes and creating thousands of internally displaced persons. The JTF and the House of Representatives have threatened to attack “militants” in Ondo, Bayelsa, and Rivers states. People in the communities in those states are fleeing, as they are terrified by what happened to the communities of Delta State. ABUJA, 22 May 2009 (IRIN) – Thousands of civilians have fled their villages in Nigeria’s Delta state after government troops launched an offensive against militant groups in the state on 13 May. Villagers in Delta state’s Gbramatu kingdom reported Oporoza and Okerenkoko villages being attacked with heavy machine-gun fire from low-flying helicopters on 15 May. Eyewitness accounts reported at least 100 bodies, according to Amnesty International’s Nigeria campaigner Lucy Freeman. The Nigerian Red Cross estimates that 1,000 displaced people have fled to Ogbe Ijoh – capital of Warri south government area – where they are sheltering in a primary school and hospital. Witnesses report that about 3,000 people have fled and Amnesty International estimates that as many as 10,000 could be on the move. Most of the displaced are women and children as most men are too frightened of being attacked or killed, said Nigerian Red Cross officer Egbero Ococity from Ogbe Ijoh. Many men are hiding in the forest with no access to clean water, food or shelter, he said. “They [the displaced] need food, water, shelter and blankets to relieve their suffering,” the Red Cross’s Ococity told IRIN. “They are sleeping on the bare floor. They are traumatised as a result of the attacks and what they went through in the mangroves while escaping. The offensive suggests a “worrying change in direction” in the government’s approach, Freeman told IRIN. In recent months a government committee recommended amnesty for some politically-motivated militants. In February 2009 the government of President Umaru Yar’Adua assured the UN Human Rights Council it would refrain from military offensives in the Delta region because of the risk of loss of innocent lives. … the Yar’adua administration has manufactured its own excuse for a greater massacre of Niger Delta women and children under the guise of fishing out militants. Beginning Wednesday, May 13, 2009 the Joint Task Force has been bombing Kurutie, Kokodiagbene, Kunukunuma, Oporoaza and Okerenkoko communities in Gbaramatu kingdom of Delta State, killing innocent persons, majority of them, women and children. Many more persons are rendered homeless; the Punch of Monday, May 18, 2009 reported that about 20,000 people are trapped in these riverine communities because the waterways are blocked by the JTF. The displaced persons who took refuge in the Ogbe-Ijoh General Hospital were further made to flee the camp due to the invasion by soldiers from the Joint Task Force. As at Tuesday, May 19, 2009, the soldiers proceeded to carry out a house to house gruesome burning of persons and properties Okerenkoko community. The implication is that the re-branding Nigeria project has succeeded in rebranding everyone in the Niger Delta militants, including women, children, governors, aged, kings, chiefs, physically challenged et al. Thousands of harmless women and children have been killed while some are displaced. Schooling has been disrupted for a great majority of children in the Gbaramatu kingdom of Niger Delta; having access to food and shelter has suddenly become a luxury; safety & security is far from the people; development has become a mockery; access to sanitary facilities for the women is out of the question. Many are scrambling to safety but no thoroughfare. The cries of the Niger Delta women have re-echoed. The Federal government is the killer of women and children. Instead of giving them food, education, health and security; the women and children of the Niger Delta are given bullets, blood, grief and poverty. WHERE DO WE GO FROM HERE? WE SAY NO TO THE JOINT TASK FORCE! WE SAY NO TO THE GRUESOME MURDER OF WOMEN AND CHILDREN IN THE NIGER DELTA!! WE SAY NO TO MILITARY INVASION OF THE NIGER DELTA!!! This is the language of discrimination. When we discriminate against a group of people, we call them lazy, stupid, ignorant, greedy, promiscuous, unhygienic. These words, individually or in combination, should serve as an immediate warning that discrimination is taking place. This language allows the majority, or minorities that hold power, to oppress and even slaughter an inconvenient group of people. They can feel comfortable with themselves by using these words. Whatever actions they take against the group may then be called “unfortunate”, but “necessary”, or even “for the best”. Amidst protests and rowdiness, the House of Representatives yesterday threw its weight behind the ongoing military operation in parts of Delta State. They also demanded that the onslaught against militant groups in the area be extended to Bayelsa and Rivers States to forestall the relocation of the militants to other parts of the Niger Delta. The lawmakers said given the large scale criminality associated with the militant groups, it would be an aberration for the Federal Government to continue to tolerate their excesses or halt the military from crushing their apparent insurrection against the Nigerian state. We can do away with 20 million militants for the rest 120 million Nigerians to live,” N’Allah said. [from N’Delta Crisis…]The comment sparked off widespread protests amongst lawmakers from the Niger Delta region who demanded a withdrawal of the statement and apologies. There was tension and proceedings of the House were stalled for at least five minutes before N’Allah in a veiled retraction said it was a “parliamentary joke”. Although communities have been terrified and destroyed, it is unclear if the actual militants have been hurt much at all. Tompolo is still alive and free. From the gun battle in Warri, the JTF alleged they captured 9 militants, assuming they are militants, and not just men who happened to be in the wrong place at the wrong time. Sola Adebayo’s picture of the weapons seized is reproduced above. After bragging about all the heavy and high tech weaponry they seized from the militants, this was all the JTF had to display. Abubakar disclosed that the suspected militants are now in JTF’s custody. The JTF, however, failed to parade the suspects before newsmen when the Commander, Maj. Gen. Sakin Yakin Bello, addressed the world press on the activities of his command in the last one week. Abubakar said the arrested men are “to assist the force in carrying out investigations to determine the level of their involvement in the militancy in the Niger Delta”. In a twist, Bello declared High Chief Government Ekpemupolo (alias Tompolo) wanted dead or alive – a week after the reports claimed the militant leader had been killed. Journalists were surprised that no arrests were made during the JTF operation, a situation which gives the suspicion that every moving object in the area was killed by the invading soldiers. The military paraded what they claimed were the weapons of the militants. Journalists were shown rusted dane guns, normally used for hunting, unserviceable collection of old guns and dirty old machetes. 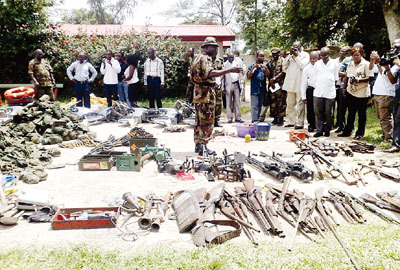 It would appear that the militants’ armoury was not as sophisticated as been claimed by the JTF. No AK47 weapon, said to be the weapon of choice of the militants, was captured by the JTF, even though several militants have been said to have died in gun battle with the soldiers. Bello refused to name the number of persons killed so far by his man, but declared that they were prepared to kill more, while also pursuing the militants to wherever they were known to hide. Bello’s declaration followed persistent questions from journalists over the handling of the operation by the JTF whose soldiers invaded the Ogbe-Ijoh General Hospital to harass and arrest doctors who were treating victims of the military attack on communities in Gbaramatu kingdom area of Warri. The action of the soldiers forced the management of the hospital to close down and discharge all the patients. The commander denied knowledge of the hospital invasion, but promised that such would not repeat itself. Bello admitted that a scanty number of weapons, including a pistol, a submachine gun, an Uzzi, a rifle, and a Mark IV, among others were captured from Tompolo’s personal house at Oporoza. He denied that innocent persons were killed in the operation even when he was confronted with the fact that the attack took place on the day of a traditional festival for which a lot of people from far and near had come to Oporoza. Chairman of Foreign Relations Committee of the United States Senate, Senator Russ Feingold, has asked President Barak Obama to intervene in the ongoing military action in the Niger Delta. Feingold in a statement, issued in Washington yesterday said “I urge the Obama administration to think creatively about how we can work multilaterally to help end this long standing crisis in the Niger Delta. “Genuine peacemaking will require not only legitimate political negotiations but a convincing case for transforming the illicit war economy into one of peace,” he stated. Meanwhile, US Assistant Secretary of State for African Affairs, Mr. Johnnie Carson, has described Nigeria as the US’ most important strategic partner in the African continent. He disclosed this at the meeting with members of the Nigerian Governors’ Forum led by the chairman, Dr. Bukola Saraki, in Washington, last Wednesday. The Governors are in the US on a working visit. The team include Alhaji Isa Yuguda of Bauchi State, Godswill Akpabio of Akwa Ibom and Comrade Adams Oshiomhole of Edo State. Carson expressed the need to strengthen the relationship between Nigeria and the US, while promising to push the process that will further deepen the US-Nigeria relationship. He commended the Governors for their patriotic initiative and assured them of his commitment to their cause. He said his doors were open to the Governors Forum at all times. Carson also described the Governors’ visit as a new dawn in US-Nigeria relationship, “This is a new dawn in the relationship between our two countries. We have never had it so good,” he said. He noted that the Governors were the first foreign visitors he was receiving since he resumed office on Monday, last week. The Governors also visited the Capitol Hill, America’s legislative power house where they had a meeting with Black America’s most powerful congresswoman, Mrs. Sheila Jackson-Lee. Welcoming the Governors to her office, Jackson-Lee observed that the visit was the first by any delegation of Governors from Africa to any congress person on the Capitol Hill. She said she would be leading a delegation of the congress to “West African sub-region very soon”. She commended Nigeria for her efforts in global peace-keeping, especially in Dafur, Liberia and Sierra-Leone. Following the ongoing military onslaught against militants in the Niger Delta region, some Ijaw living in coastal areas of Ondo State have begun fleeing their communities for fear of being attacked by the men of the Joint Task Force. Eleitu-Uguoji who is the National Coordinator of the Ijaw Consultative Forum blamed the indiscriminate attack of civilian settlements in Delta State for the apprehension among Ijaw people all over the country. He added that the people were afraid because they believed that the men of the JTF were looking for Ijaw people since it was difficult to distinguish a militant from innocent civilians. He explained that although community leaders were appealing to people in their areas not to panic, he stated that it was not possible to prevent them from fleeing due to the news of killing and maiming of innocent civilians in Ijaw communities in Delta State. He said, “Although we have not seen either military presence nor militants‘ presence in our communities the people are afraid and they are leaving, especially the women and the children. “They are afraid because militancy is not written on anybody‘s face and it will be almost impossible to know who is a militant among the crowd. The Special Adviser to the Ondo State Governor on Niger Delta Affairs, Mr. Bekekimi Idiarhi, told our correspondent on the telephone that he was not aware of movement of Ijaw in Ondo State to safer places. But he said that there was palpable fear among the Ijaw people living along the coast from Ondo State to Akwa Ibom State . A major and deadly intervention by the Nigerian army is underway for almost two weeks in the conflict-ridden, oil-producing Niger Delta. Last Thursday, I had an interview with Udengs Eradiri, Secretary General of the Ijaw Youth Council (IYC). He points to the fact that officials of the Nigerian government and army actually equip the insurgents and take part in the oil bunkering business. Read the interview in the German daily Neues Deutschland tomorrow and on this blog on Wednesday (extended English version). GOVERNMENT, WE ARE NOT HAPPY WITH THIS NONSENSE,CAN SOMEONE TELL ME THE DUTY OF THE GOVERNMENT?CAN SOMEONE DEFINE DEMOCRACY FOR ME?SO WHAT IS THIS THAT THEY GOVERNMENT IS KILLING OUR BROTHERS AND SISTER,CHILDREN AND MOTHER AND FATHER COZ OF OUR OWN NATURE RESOURCES…SHAME TO THE LEADERS, IF THIS NONSENSE CONTINUE I WONDER WHERE THIS COUNTRY WILL END UP.HOW CAN THE GOVERNMENT OF A COUNTRY SEND TROOPS TO KILL THEIR OWN BLOODY,SHAME TO NIGERIA PRESIDENT AND OUR ENTIRE LEADERS..
What you say is true, I have no good answers for your questions.